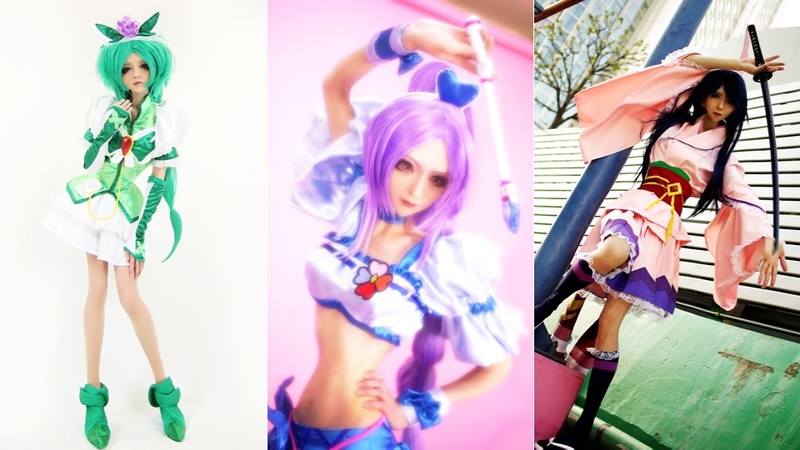 Cosplayers are often criticised for using too much Photoshop for studio pics. Eyes are made slightly bigger, waistlines are made smaller and the end result doesn't reflect reality. Yet, they do — just an idealised human reality. Then, there's cosplayer Hiiro, who's been going bananas with Photoshop and mixing human features with anime ones. In the photos, Hiiro looks more humanoid than human. Hiiro, a huge anime otaku, cosplays as both male and female characters, but recently has been focusing more on female characters. Check out Hiiro's official blog as well as Japanese site Kinosoku for more photos. I've seen people pull of some pretty impressive non-photoshop anime eyes in cosplay using either eyes drawn on the back of their eyelids (which really only works if you're doing photo shoots) or through the use of Circle Lenses and other contact/makeup visual trickery.